You know it’s important to drink lots of water before, during, and after a workout, but you might be forgetting something! During exercise, your body also loses electrolytes, and you need to replenish them for proper organ and cellular function. Common electrolytes include sodium, potassium chloride, and bicarbonate. Sodium regulates the total amount of water in the body and the transmission of sodium into and out of individual cells also plays a role in critical body functions. Many processes in the body, especially in the brain, nervous system, and muscles, require electrical signals for communication. The movement of sodium is critical in generation of these electrical signals. The proper level of potassium is essential for normal cell function. Among the many functions of potassium in the body are regulation of the heartbeat and the function of the muscles. Chloride is the major anion (negatively charged ion) found in the fluid outside of cells and in the blood. Chloride also plays a role in helping the body maintain a normal balance of fluids. It is especially important to replenish electrolytes after exercise, because many electrolytes are lost in sweat. You can replenish your electrolytes by consuming sports drinks, juice, milk, and many fruits and vegetables. 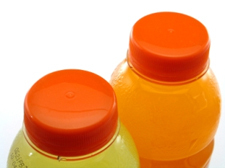 Perhaps the most common and efficient way to replenish electrolytes is through sport drinks like Gatorade and PowerAde. These drinks offer a good source and adequate amounts of carbohydrates and electrolytes to replenish your body. So remember, next time you plan your workout, don’t forget to include a way to properly recover and nourish your body! 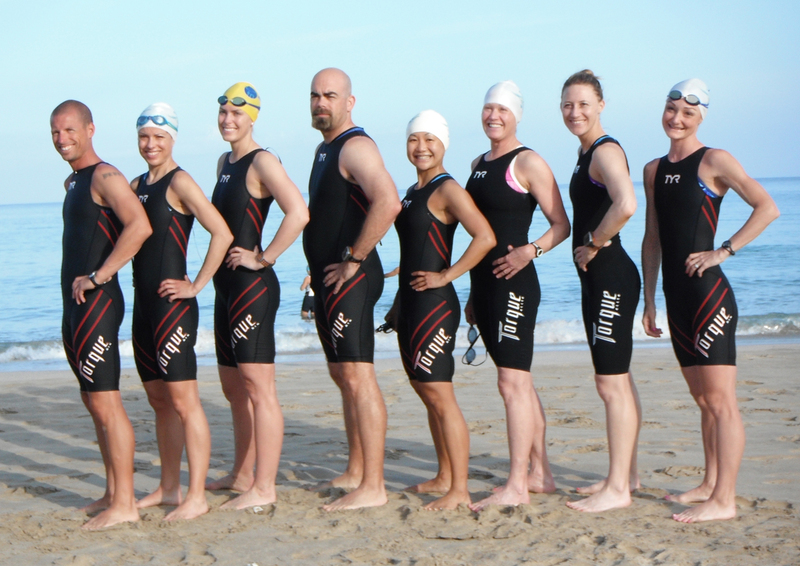 On Saturday, June 4th Seattle Athletic Club was represented in Kona, Hawaii at the Hawaii 70.3 triathlon. The course consisted of a 1.2 mile ocean swim, a 56 mile bike ride on the Ironman championship course with the winds and heat delivering as always, and a 13.1 mile run through the Mauna Lani golf course with a spectacular view of the ocean. Bridget Jones – 5:05 and 5th in her division qualifying her for the Vegas World 70.3 championships. Mark Webb – 4:46 for his fastest 70.3 to date and a great lead-up to Ironman CDA in just a few short weeks. Tom Camp – 6:11. So much stronger with more experience going into the race this year! Amanda Camp – Had an amazing performance dropping time in all three disciples from the previous year and landing herself a finish time of 6:38. Kirsten Nesholm – Broke 6 hours with fantastic overall performance with a finish time of 5:50. Bri Cooper – Stayed strong and positive after switching out 3 flats in the heat of Hawaii. Way to finish proudly! 6:48 (and with 42 minutes of flat tires). Karissa Lackey- Had an amazingly quick swim and bike! Finishing in 6:11. If you are interested in training with a team or individual coaching please contact Teresa Nelson for more information. Multisport and Running Season Kicks Off! As the weather finally (at least we think…) starts to take a turn for the better, the local multisport and running race season commences! The first weekend in May brought the first multisport race of the season for many athletes racing in the PNW, as well as half marathon and marathon mania! It was a jam packed race weekend as SAC members participated in events from Vancouver Canada all the way down to California! With plenty of races came plenty of stellar SAC member performances! Check out the what and where your fellow SAC friends have been racing!!! A tough and challenging half iron distance course (1.2mile swim/56mile bike/13.1mile) with lots of hills and trail running thrown into the mix! Not only that, but what makes this race so unique is the fact that participants have to camp pre-race because it is nestelled in the middle of now where!!! What can we say, it adds to the “charm” and comraderie of the race! Mark Webb – (OA: 5:15:35; 31:40swim/2:55:36bike/1:44:42run) A super race preping for Ironman Couer D’Alene! Genevieve Priebe – (OA: 7:32:38; 41:32swim/3:51:39bike/2:46:52run) Her first triathlon ever and tackled a half iron! 5/1: Mt. Rainier Duathlon, Enumclaw WA. A short course or long course option duathlon of super challenging porportions in the name of a huge climb called Mud Mtn. Dam in which the long course participants had to tackle twice! Karen Jones – (OA: 1:42:30; 13:38run/52:03bike/32:55run) Getting the first race jitters our before HONU 70.3! Bri Cooper – (OA: 1:39:47; 13:16run/51:14bike/33:13run) Super effort all around! Teresa Engrave – (OA: 1:50:25; 13:37run/56:16bike/36:15run) Nice and solid race! Vicki Boivin – (OA: 2:34:06; 37:10run/1:29:19bike/25:32run) 2nd overall female! Amanda Camp – (OA: 3:19:35; 47:36run/1:51:32bike/36:15run) Pushed it till the end! Tom Camp – (OA: 3:02:41; 41:13run/1:46:13bike/32:32run) Shaved 8+min off of his time from last year! Ann Sloan – (OA: 3:28:08; 53:20run/1:52:15bike/38:20run) CDA Ironman watch out! Bridget Jones – (OA: 2:36:09; 37:28run/1:29:19bike/27:23run) 3rd overall female! A beautiful and scenic half marathon through the city and Stanley Park! David Landers – (1:47:32) A personal best on a “fun” training run, not bad! Patricia Nakamura – (4:05:06) A super effort gearing up for Ironman Canada later this summer. A fast and fun course! Elizabeth Martin – (1:39:42) A fantastic result and a personal best! A scenic city run with great support and cheer! Chuck Cathey – (1:41:54) A stellar run that landed him 3rd in his division! If you see any of these athletes roaming around the club feel free to give them a big high-five for their awesome efforts! 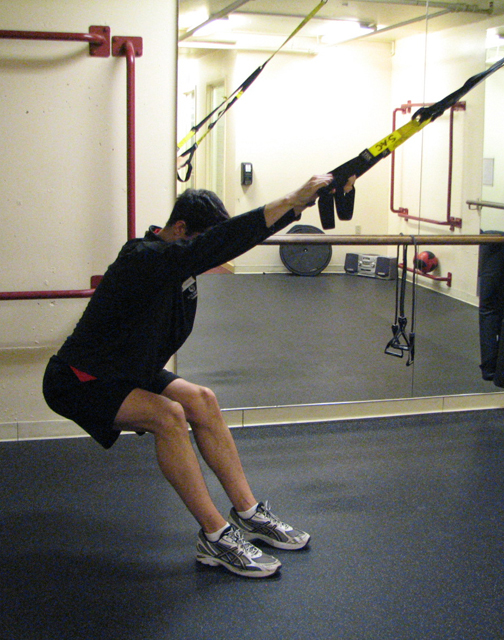 There are multiple benefits to stretching while using the TRX. 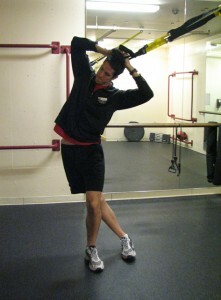 You will be able to move through greater range of motion which will deepen the stretch, making it more beneficial. You will also be able to use your own body weight to “lean” into the stretch. This is a great cool down for the end of your workout since you will have to use the muscles that were just worked to assist with the stretching. Facing the TRX anchor point, with your arms straight, reach your hips back keeping the spine straight. Relax and head and neck, allowing the head to drop between the shoulders. Keep your weight in your heels and take a few deep breaths. You will feel this all down the back and underneath the armpits. 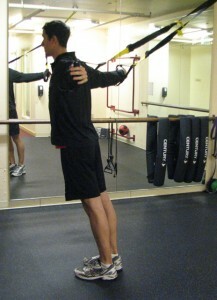 Turning away from the TRX anchor point, keeping the arms at shoulder height and the palms facing out, walk forward until the stretch is felt in the upper chest muscles. Be sure to keep the upper neck muscles disengaged and the shoulders stay down. Once the stretch is felt you can take a small step backwards and lean your weight in to deepen the stretch. This allows gravity to assist. 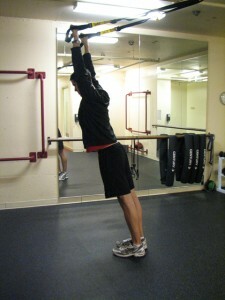 From the chest stretch you can move directly into the shoulder stretch. Keeping the same angle, move the arms up so they are close to your ears. Again, keep the upper neck muscles disengaged and focus on your breathing and relaxing. You can also walk back some to let gravity help pull more. With your arms out wide in the chest stretch, standing up straight, reach one foot far behind you (like a lunge). Ground yourself through the heel of the front foot and move your body forward. The stretch will be felt in the front of the thigh behind you. Keep the spine tall and the chest big. Standing straight, facing the anchor point, place one foot forward with the heel down and toes up. Keeping the spine tall reach the hips back and lower down. 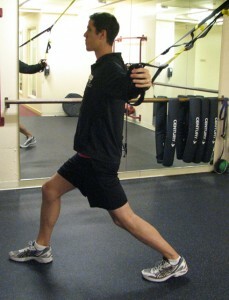 You can also point the toe (like a ballet dancer) which will stretch more of the belly of the hamstring. 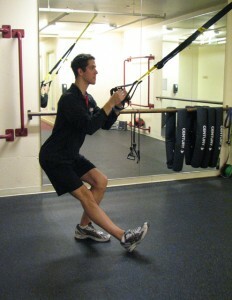 If your hamstrings are fairly flexible, this stretch may not be felt as intensely as the other stretches. Standing up straight facing the anchor point, pick up one leg and place the ankle on the thigh of the opposite leg. Keeping the spine tall, reach the hips back. The stretch will be felt through the hips of the bent leg. Avoid any kind of forward bend. Understanding swim lingo can be a challenge. In some cases it’s similar to learning a new language. Instead of spending your quality workout time with your feet on the pool floor we’ve assembled a “user manual” to help guide you to more swimming and less interpreting of a written workout that may be posted. S: Swim-Typically most swimmers resort to “freestyle” or “crawl” stroke during this, but swim truly means swim, just move through the water. Drill: There are lots of drills to choose from, choose the ones that would benefit your stroke the best. Just think of the crazy movements your coach has you do all the time. I.M. : Individual Medley: This consists of all four strokes in the order of fly, back, breast, and freestyle. Bilateral Breathing: Alternating sides that the breath is taken on. This would mean taking a breath on “odd” numbers of strokes. Three, five and seven are most common. Length of a pool: Pools are typically 25 yards, 25 meters, or 50 meters (SAC is 20 yards). Length: One way down, ending up on the opposite end of where you started. How many laps for a mile: 1650 yards (66 lengths OR 33 laps in a 25 yard pool); 1500 meters (60 lengths OR 30 laps in a 25 meter pool); 1500 meters (30 lengths OR 15 laps in a 50 meter pool). Seattle Athletic Club Downtown is a 20 yard pool. One mile: 1650 yards (just shy of 82 lengths OR 41 laps). Defined: You start a 50 every minute and repeat 10 times. This includes your REST period. If you swim the 50 in :45 seconds you get :15 seconds rest. If you swim the 50 in :55 seconds you get 5 seconds rest. Defined: You swim 50 yards and take :10 seconds to rest and then do it again. Repeat this 10 times. Defined: Get faster on “each” 100. *This is an example of descending by 5 second per 100. *The first on is slow and the last one is fast. Defined: Getting faster “within” each 100. The first 25 yards is slow, the middle two get progressively faster and the last 25 is FAST. There is 10 seconds rest after each 100. Defined: The first 25 of each 75 is a “drill” of your choice unless specified, the last 50 is regular swim. There is a :10 sec rest period after each 75. If you have any questions on your swim workouts or need some variety in your training or even a lesson. Please contact Aquatic Director/Multisport Coach Teresa Nelson. What Exactly is V02 Max? Many of you may have heard the term “V02 max” thrown around when talking about your cardiorespiratory endurance and aerobic fitness, but I’m sure many of you are all wondering the same thing…What exactly is V02 Max and should I get mine tested? VO2 max is the maximal oxygen uptake or the maximum volume of oxygen that can be utilized in one minute during maximal or exhaustive exercise. It is measured as milliliters of oxygen used in one minute per kilogram of body weight. VO2 max is one factor that can determine a person’s capacity to perform sustained exercise and is linked to aerobic endurance. It is generally considered the best fitness assessment tool available to accurately identify the appropriate training intensities specific to your fitness needs/goals. VO2 testing is the best way to measure your cardio fitness and maximize your workout. Each person has a unique optimal training zone. 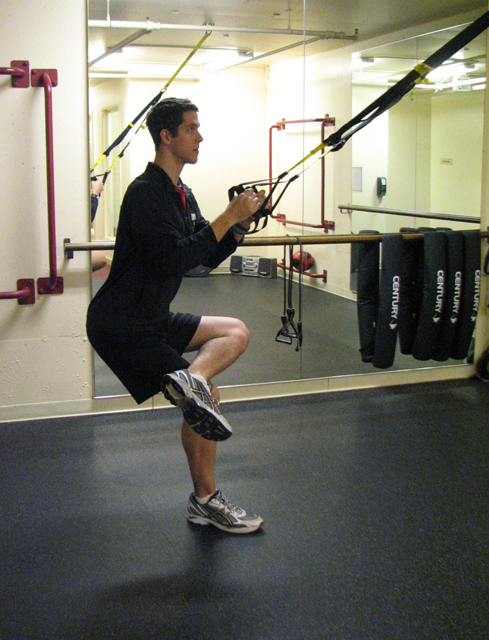 Exercising at different levels of intensity will meet different fitness goals. Some intensities burn more fat, some increase endurance, and some focus on strengthening your heart. As you may know, the calories burned calculated on cardio machines are not known for their accuracy. Some machines are even known to bump up the calorie readout by almost 25%! Furthermore, machines do not always take into consideration all the factors in individual fitness levels and the specificity of the exercise, so relying on these machines to give you an accurate calorie and heart rate count can hold you back from attaining your goals if your not careful. Also, many of the charts you see on exercise equipment displays target heart rate based only on age. V02 max testing measures your precise target heart rate, then calculates your personal target intensity zones and how many calories you burn in each zone. These zones give you the precise heart rates necessary to optimize each level of exercise and maximize your results, so you workout smarter, not harder. WHO SHOULD TEST THEIR V02 MAX? With spring approaching quickly and marathon/swimming/cycling season underway, now is the perfect time to maximize your potential and workout smarter, not harder! The Han’s paddles (the small black ones) are smaller and are a great place to start when first using paddles. Because the Han’s paddle does not have a wrist strap it gives you immediate feedback as to whether you are swimming efficiently. If at any time the paddle is sliding on your hand it is telling you that you are not keeping adequate water resistance on your hand and are not propelling your bodyforward. 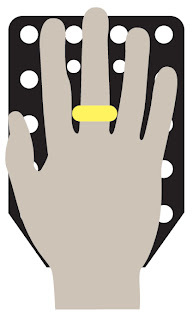 These can be worn in three different ways but the most popular is with the boxy end at the top of your fingers and the more curved end at the bottom (as illustrated). This position teaches the hand, wrist, and elbow order of entry and encourages the downward sweep of the hand and high-elbows positioning in order to continually reach for “new” and “more” water with each stroke. The Strokemaker paddle (which comes in various sizes and colors) is the bigger paddle that we offer. It increases distance per stroke by preventing you from allowing an early recovery (exiting arm from water). The size allows for strengthening of your swimming-specific muscles and aids in water propulsion. It is imperative that you do not take out the wrist tube in order to ensure proper use and to make sure you finish your stroke. You can use paddles in any stroke but be aware that the larger the paddle the more stress is put on your shoulder joint. Make sure, if you start using paddles, to start out slowly. Only use them for 200-300 yards for the first few sessions and then build upon that. If you have any shoulder pain, stop. Start with the smaller paddles (ie: the black Han’s paddle or the green Strokemaker paddle) and build up. Most recreational swimmers should not go beyond the yellow Strokemaker paddle as the red (the largest we carry) is designed for elite swimmers or those that have been swimming with paddles for some time. The time is here for the weather to change with winter rolling in, and the days getting darker faster. Exercisers can still take their workouts outdoors to beat the winter blues, and stay off the couch. Going outdoors and exercising with the proper gear allows you to get moving around, giving the body a chance to adjust to the changing season and get revved up for the day. Now you are motivated and have your layers on, and skin protected; it’s time for the outdoors. Try to head into the wind – less likely to get chilled on way back from your exercise. Drinks fluids before, during, and after – you are sweating so watch out for dehydration. Use a headlamp not just for your own ability to see, but for others to see you most likely you will be in the dark. Staying motivated during the winter can be fun, rewarding, and good for cabin fever. You have the knowledge, and fortitude to meet your goals, of staying active not sedentary. For many people winter outdoor exercise is great for solitude, and quiet time.